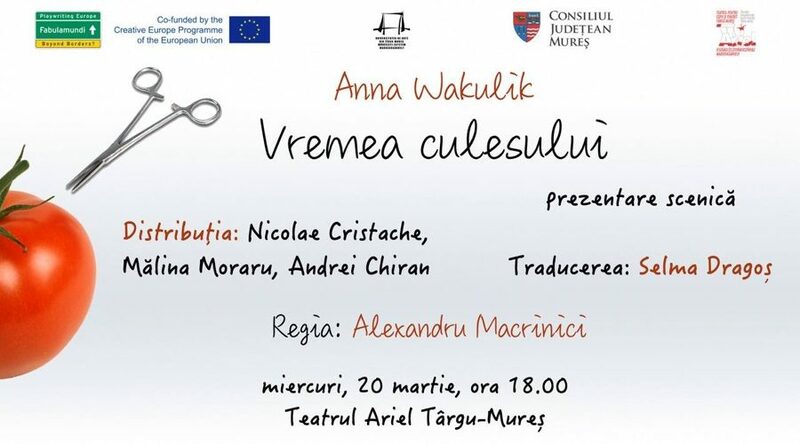 On 19-23 March, the University of Arts Târgu-Mureș presented A Time to Reap by Polish playwright Anna Wakulik on stage at The Ariel Children and Youth Theatre. The author also ran a playwriting workshop for the postgraduate students of the Playwriting MA course of the University of Arts. Read below what the playwright wrote about her experience. Imagine a morning, short checking: toothpaste, keys, battery charger, purse, liquids all in big suitcase, then a taxi (it’s late! A little argument with the taxi driver, unrolling into a story of a Polish political scene: this people, ma’am, are stealing, these are all sons of communists! Didn’t you know that?! I’m telling you the truth! ), no traffic jam this time, quickly go to be touched by the security guard (a little pleasure, no drugs, no bomb, thank you), not the cheapest sandwich on the planet, being seated close to the man, who used way too much colony water, a little propeller starts rolling like crazy, you’re in the sky, coffee?tee?snack? yes, please!, little headache, little fear, thanks God, we made it again: we’re on the ground somewhere else, somewhere surrounded by the mountains. And then the loud silence. People talk, yes, they speak, the mouths are opened, but you don’t know what’s being said: some problem is discussed? Do they like each other? Do they not? Is it divorce going on, a love story? In the middle of the arrivals, with a banana waiting to be eaten, someone touches your arm: “no rush. Eat your Polish banana. We did only stop at the forbidden area. Seriously, no rush”. It’s the director of your reading, smiling. And you know this will be a good trip. Two hours of ride from Cluj- Napoca to Targu Mures are filled with the bitter jokes: “this is our hi-way, it’s only two kilometers long”, “should it be this long?”, “no, it should be longer”, “so where are missing kilometres?”, “well, some people built some houses” (a day later we walk up to the beautiful hill and he says, pointing to a big big big house: look left, well, this is a kilometer of a high-way, look right, I suppose- three kilometres. It was a pleasure to show you our infrastructure”). You’re entering the hotel, which must’ve been shining before ’89, you look deep into the eyes of a lady, who seems to have better plans for today, you’ll be waiting for a waiter next morning, who will tell you without even a little drop of smile: NO MORE EGGS, and you know: you’re home. You’ll also feel it during the workshop you lead: dark, very dark irony, and we try to analyse: is it good to be ironic all the time? How does it change you? Isn’t it a wall you’re making not to be hurt by the world? Isn’t it a tool to avoid the painful truth? And to make a distance between you and the world: it’s just funny, I’m not involved, I don’t want to be a part of it? Is it somehow connected with where we come from, with what history has done to our parents? Who will we be if we were raised in sunny California? “A very talented homeless on San Francisco street”- says someone. And we laugh. Then the reading of your play: great actors you see and you must ironically admit: a good text you wrote. But wait, what’s going on? The laugh. First, second, third wave of laugh, then again and again, WHY DO THEY LAUGH SO MUCH? It’s a sad play, they’ll all be apart at the end! Hey, people! But they don’t listen to you. They laugh. I’m using a tool of exaggeration now, of course it wasn’t only laugh, but I’ve never experienced the audience abroad catching every joke, every little detail, every small element, which built this funny-sad world of the characters. They told me they were moved because it’s their reality. “So, tell me, are you Romanian?” asks me the director. You know this is also your fatherland, this beauty mixed with a bad times of the country. You went through the similar history. You know this is the platform of understanding the jokes: you and your director are both young, you travelled, you speak English. But the irony in your blood grew somehow out of the context, it grew because you know the reality of the past and reality of now, the reality of here and there, the reality of Targu Mures and San Francisco. And you’re leaving, after the very bad night because the infection of your throat has just started, and the director drives the car, and he’s very patient: “if you want to puke, just do it. I experienced it. I have a dog”, and you feel better. And when it comes to the heartbreaking scene of saying good bye at the airport, and a little movie with all funny and serious conversations you had in last four days is being screened in your head, you’re finally ready to say: yes, Sandu, I’m Romanian.